Policymakers claim ‘stock market overreaction’ while vowing for relevant contingency plan. Despite hullabaloo in the stock market accompanied with pessimistic economic indices, the South Korean government on Tuesday denied the signs being the bellwether of another economic crisis. While vowing to keep a stern eye on market fluctuations, top policymakers underlined that the bourse “overreacted” to external risk factors such as the US-China trade conflict and US rate hike gestures, and that it remains premature to go as far as activating a contingency plan. “Considering the fundamentals of our economy, the recent responses (of the stock market) are in fact excessive,” Financial Services Commission Chairman Choi Jong-ku told reporters. On the previous day, the financial regulator had revealed a market stabilizing plan to inject some 500 billion won ($440 billion) into the stock market. Within hours after the policy announcement, however, the country’s bourse nose-dived with the top-tier Kospi closing at 1996.05, marking a sub-2,000 close for the first time in 22 months. The fact that the government’s continued efforts for market revitalization had come to no avail triggered anxiety that the latest stock market plunge may hint at a prolonged economic downturn, instead of a passing market phenomenon. “The recent situations are clearly different from those in the 2008 financial crisis,” Choi said in an urgent meeting earlier in the day, denying the pessimistic scenarios. The drastic fluctuation shown in Seoul’s bourse was also attributable to the relatively high proportion of foreign investment here, compared to emerging economies in the Southeast Asian region, he added. Deputy Prime Minister and Finance Minister Kim Dong-yeon also refrained from immediate policy actions. “We are considering various options such as overseas investor relations, revision of institutional investors’ role and partial reform of the (stock trading) system,” Kim told reporters. When asked about the possibility on stock exchange tax reduction, the fiscal chief called for “caution,” gesturing at reluctance against drastic responses. The Bank of Korea also claimed that despite the recent stock depreciation, the South Korean economy still maintains its strong fundamentals. “The foreign bond funds switched into an uptrend in mid-October, while foreign currency liquidity remains favorable,” the central bank said in a press release, following a monetary finance action plan meeting. The occasion was attended by BOK Senior Deputy Gov. Yoon Myun-shik and other director-level officials. 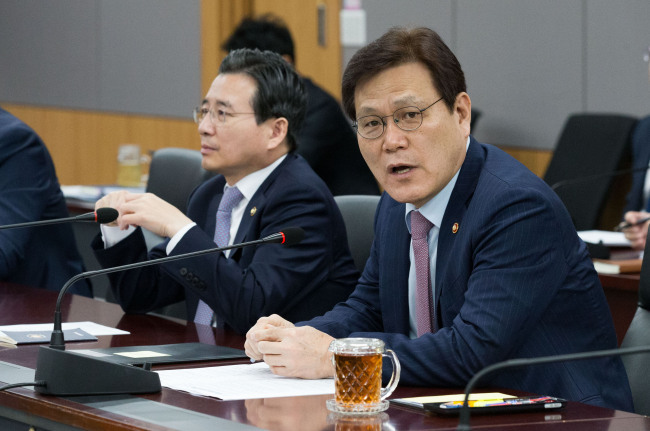 While policymakers strove to pacify market anxiety, Cheong Wa Dae once again denied the rumors on the dismissal of Finance Minister Kim and presidential chief of staff for policy Jang Ha-sung — the nation’s top two economic officers. “We have not heard of their replacement,” said Yoon Young-chan, senior presidential secretary for press affairs, in a text message sent out to reporters. His words came in response to local media reports that Cheong Wa Dae is seeking to replace Kim and Jang in order to bring new momentum to the nation’s lackluster economic situations.